Unique business cards and premium business cards are our specialty, this is why our new 24 pt. silk laminated matte thick business cards with painted edges are so cool. 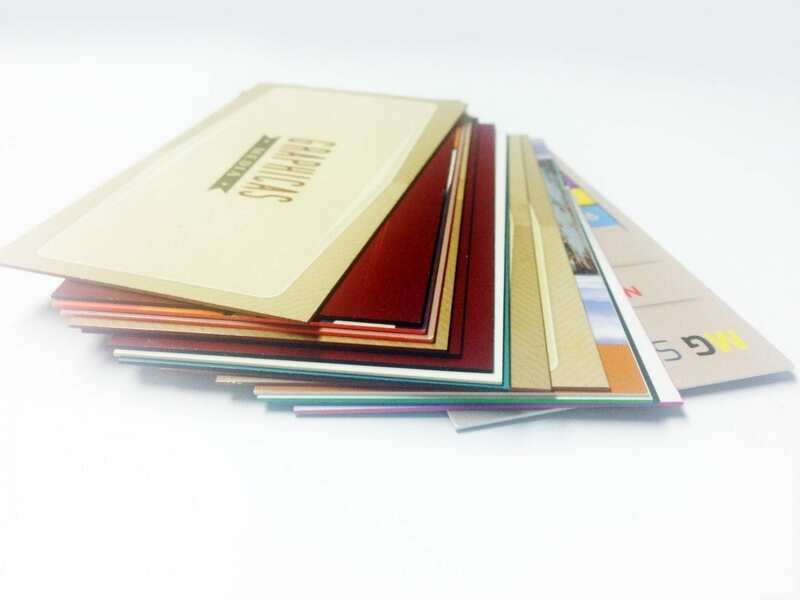 Unlike with standard bulk Business cards, our cards ultra thick business cards are designed to make a lasting positive impression the moment the consumer receives one in their hand. On average, the standard business card gets glanced at for a few seconds before getting crammed into a consumer’s purse or pocket. They are about twice as thick as the cheap cards you may get at Kinkos or Vista print for $10 with their boring stock designs that everyone has. However, it’s up in the air whether or not the consumer will even remember if they have a client’s business card when they really do have a need for their particular product or service. A strong impact is made only with a strong presentation of a brand, product or company, and we are happy to help clients immediately grab the consumer’s attention to make a lasting first impression. This is why we emphasize to our clients to get the design and the format of their Business cards just right, since they need to accurately portray the type of business they are running in a few seconds. Shape, size, proper information positioning as well as color and pattern selection are undeniably important in a business card’s format. Unfortunately, many well designed Business cards are not durable enough to stand up against dampness, fading, bending or creasing over time. Our unique Business cards are not only durable and sturdy, they are also vividly detailed without looking cluttered or unreadable. Sturdy and durable, our 24 pt. Business cards display vibrant colors, unsurpassed detail and eye-popping printing that is protected with a high quality matte or glossy finish or an can be produced non-coated to compliment any design. Our clients can even add more impact to their 24 pt. 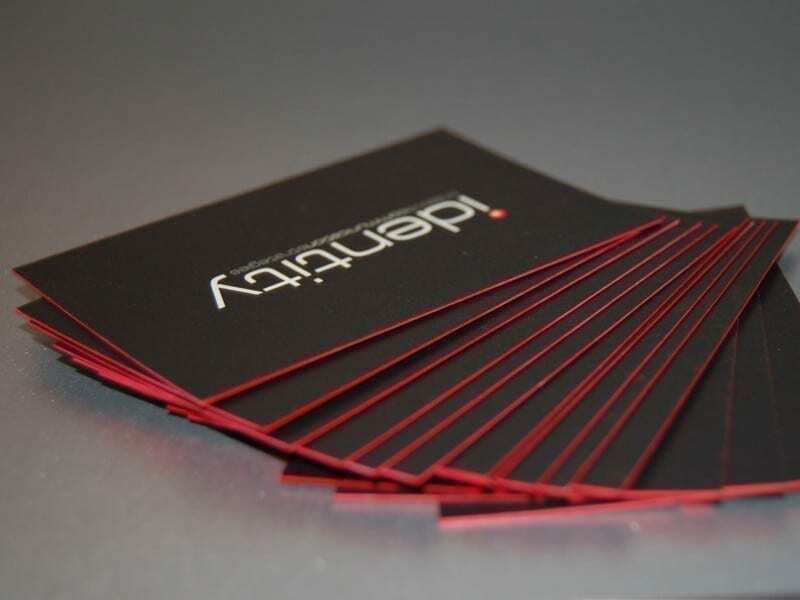 ultra thick Business cards by ordering painted edge Business cards. Painted edge Business cards are the ideal Business cards for CEOs, small business owners, architects, contractors, financial institutions, interior designers, law firms. Additionally, all of our business card options come with bright white stock at 98% brightness with silk laminated finish! Ultra thick Business cards can also come in bright florescent painted edge options, even silver and gold painted edges as well. More likely than not, a consumer that sees one of our 24 pt. premium Business cards will immediately connect a specific client with the services they are offering even months after they first saw the card! Lets face it in todays world there is nothing but competition and especially when your out networking you need something that will stand out from the other hundred cards your potential client will get that night. These ultra thick Business cards are of premium quality and compatible to each and every one of our client’s card design requirements. Invest a little bit now to get big returns tomorrow. Some people may think “ohh i dont need these fancy cards” but what these kind of cards say about your business is that you believe in quality and you can trust us to be the same. Top Class Signs and Printing operate our printing business in Miami, so if your local stop in for all your printing in Miami or printing in Doral needs. If clients need assistance with printing options along with selecting the right colors, patterns, layout or designs for their bulk orders, our expert staff will be more than happy to help. Next Next post: Wishing for Business but Don’t Know What to Do?